How Did Tesla Electrocute Himself and Live? When 10-year-old Nikola Tesla, growing up in Croatia, saw an engraving of Niagara Falls in 1866, he envisioned a giant waterwheel harnessing the water’s power. In 1895, Tesla realized that vision. He helped George Westinghouse, founder of the Westinghouse Electrical Company, build a power plant at the falls. It transmitted electricity using a system that Tesla designed and that made electric power a feasible source of energy for the world. Thomas Edison was the first person to transmit electric power to homes and businesses, but he relied on direct current, which can only go about a mile before losing potency. To power an entire city, Edison had to build generators for every neighborhood, and often for individual buildings. With that much equipment in operation, power failures and fires were common. Tesla pioneered the use of alternating current (AC), which could be transmitted hundreds of miles from centralized generating facilities, making the transmission of electricity safer and more efficient. At the 1893 World’s Fair in Chicago, Tesla and Westinghouse fought back. Tesla displayed the world’s first neon signs, which were powered by AC and shaped to spell the names of famous scientists. He also shot two million volts of AC through his body, and came away unharmed–partly because he wore rubber shoes and partly because he used a high-frequency current; it danced harmlessly across his skin and bathed him in a blue halo of electric flame. 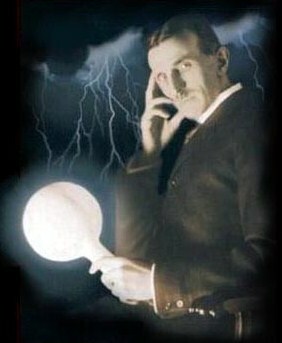 His demonstrations convinced the public that AC was safe, and since then more than 80 percent of the electric devices sold have used alternating current.